The Roddlesworth Roller is a friendly 9km trail race on good paths/roads around lakes and through woods. It is run by athletes of all ages and abilities, from 16+ to 80+ and national athletes to absolute beginners. The Daffodil Doddle is a 2.2km road/trail race for Junior and Fun runners, using part of the Roddlesworth Roller course (no public roads). 7/3/2010 Please park consid\erately and do not use pub car park. 6/3/2010 Marshals meet outside Hare and Hounds at 10:00ish. Wrap up warm. 6/3/2019 Online entries are closed. Still possible to enter on the day. For more information please join Chorley Athletic and Triathlon Club Facebook Group. "Just wanted to say thank you for sorting out the swap with your wife - she was really helpful ..... we had a great time and even the weather manged to stay off for the race. "I survived my race! It was surprisingly warm running, but geez that wind!!!! Was actually super fun sploshing through all the mud and puddles (and a river??). ARC Race Permit Numbers : Applied for. Please park legally on Bolton Road (or satellite roads), Naja car park, Dole Lane, Twistmoor Lane, as there is only limited parking at the school. Please share cars if possible. Do not park on junctions, crossings and in from of or in the car park of the Hare and Hounds. Extensive refreshments are available to purchase before and after the racing from the school. Runners will get free food and drinks after the race. Please wear clothing and footware that is suitable to the season and weather. The Doddle can be completed in virtually any type of footwear, but the Roller really requires trainers with some grip. At least 3 First Aid teams will attend the race. They will be based at the Start/Finish, and at the top and middle of the Roller course. Please meet outside the Hare and Hounds at 10:00 on the Sunday morning of the event for briefing. We always need more helpers, so please come along if you can lend a hand. 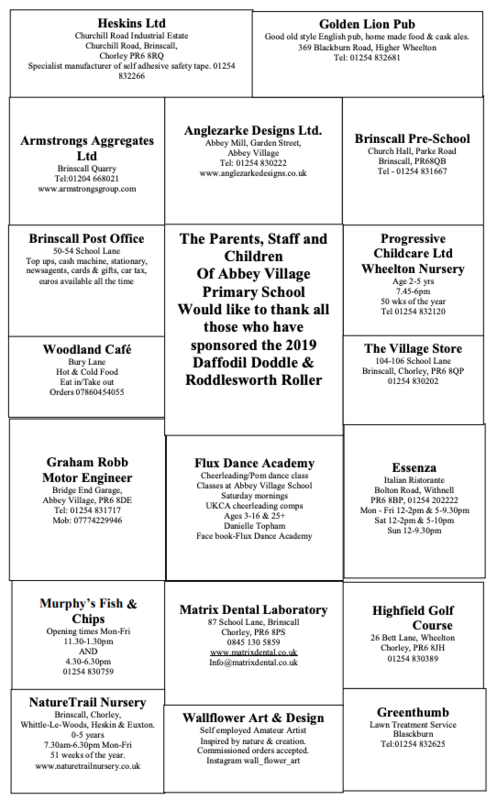 All marshals and helpers, Abbey Village School, Chorley's Angels First Aid, United Utilities, Raynet, Sponsors, The Endurance Store, John Schofield Results, Chorley Athletic and Triathlon Club. On behalf of Abbey Village School and Chorley Athletic and Triathlon Club, a massive thanks to all runners and helpers (club members, school teachers and parents, Chorleys Angels, Raynet, United Utilities, Schofield Family, Tony Bolton Sports) that helped make today's Roddlesworth Roller and Daffodil Doddle a safe, fun and competitive event.